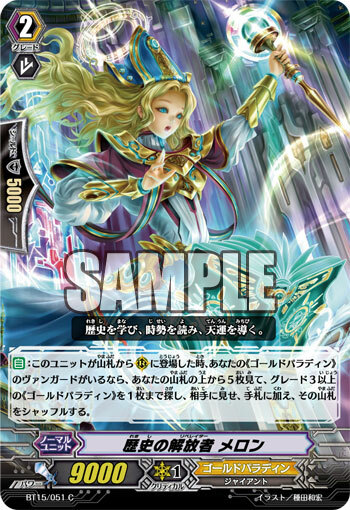 [AUTO]:[Put this unit into your soul] When this unit is placed on (RC) from your deck, if you have a «Gold Paladin» vanguard, you may pay the cost. If you do, look at three cards from the top of your deck, search for up to one card with "Liberator" in its card name, call it to (RC), and put the rest on the bottom of your deck in any order. 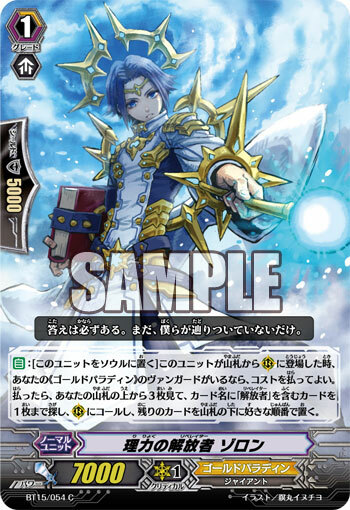 [AUTO]:When this unit is placed on (RC) from your deck, if you have a «Gold Paladin» vanguard, look at five cards from the top of your deck, search for up to one grade 3 «Gold Paladin», reveal it to your opponent, put it into your hand, and shuffle your deck. Force Liberator, Zorron: "There’s always an answer. I just haven’t figured it out yet." History Liberator, Merron: "Learn the history, understand the spirit of the age, and thus you’ll be able to understand destiny itself." Made “Liberators” after being assigned to the “Gold Paladins” after the group became the country’s second standing army. these two are sages who help the lead the warriors of light. Merron, the Sage of History, possesses a staff given too her by the sage of time “Zenon”, her “Staff of Heavenly Wisdom”, which records the history of Cray as video. Meanwhile, Zenon gave Zorron, the Sage of Force, a book called the “Book of Heavenly Wisdom” which contains the history of Cray in words. One day, these two were entrusted with a task when they were very young, an important duty from their master “Zenon”. He told them, in frankly too short of a command, “Find the light”, and while they mulled over his words, the answer came several days later, when they were summoned by the King of Knights. The king decreed to them “Discover what was the light of hope that Genesis foresaw”. Upon hearing this, they wanted to join the knights, and the king granted them the title of “Liberator”. Even though they don’t like conflict, even though the King of Knights ordered them, if it wasn’t for Zenon’s message before, they probably wouldn’t of joined. Thus, the two poweful sages became Liberators. Searching for the light of hope, they plan to hand down all information about it to future generation. They continue to record the history of the world, carrying on their teacher’s spirit.